Anyone who's followed my blogs knows that I'm constantly whinging about my gas oven and it's tendency to vent steam as quickly as I can create it. But it's true: my relationship with my oven is probably like that of Ike and Monty in WWII - hated one another but needed each other. So, having tried the numerous Rube Goldberg remedies found on TFL (I'm still using lava rocks in a cast-iron frying pan), and found them either impractical or wanting, I read Sylvia's recent post with interest - but skeptical interest I must admit. I slightly improvised on Sylvia's instructions: I thoroughly soaked a terry cloth towel in water, placed it in a glass pyrex bread pan, filled it 3/4's with water and then nuked it in my microwave for about 10 minutes before placing it in my oven just before loading my loaves. On loading a cup of water was carefully tossed onto my lava rocks, and then two minutes later, another half cup. I removed the pyrex pan with the towel 15 minutes prior to finishing the bake. Oh the result! The most oven spring and the best opened cuts I've ever had at home - easily! If I could sell Sylvia's technique I'd be like Ron Popeil at this point. However, I'm having difficulty visualizing an infomercial featuring a terry cloth towel steaming in a bread pan, so I'll give that a pass. However, I will heartedly add my endorsements to those Sylvia has already received. This is one way of overcoming the shortcomings of home kitchen gas ovens. And how! 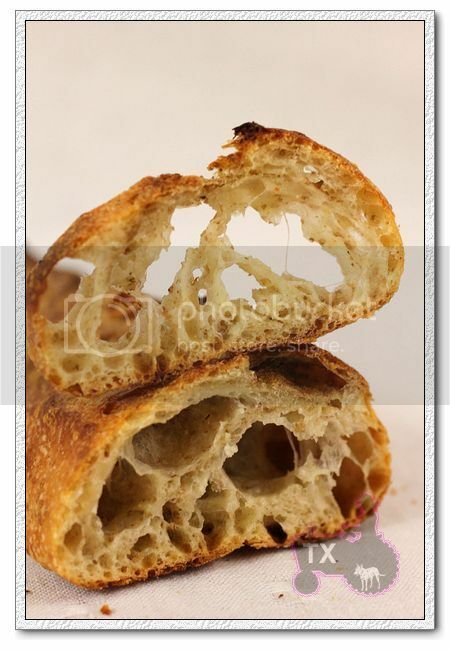 Again, I want to introduce some breads that I make over and over! My family loves these bread as I can tell is they don't complain to me that they are tired of these bread. They ask me more slices of these often. First, This bread was posted by Daisy_A ( http://www.thefreshloaf.com/node/19923/bread-art-heritage-katy-and-rebecca-beinart039s-work-and-simple-white-sourdough-tin-loaf) I posted this bread before, but I got a lovely letter from one of my husband's coworker who loves bread. She said that this was the best bread I ever had! she and her mother ate every bit of crumb until it was completely gone! I was really happy to hear that they enjoyed this loaf. I love this bread, too. I can't count how many time I made this. It is sourer that I usually attempt for the other bread. This bread shloud be the way, and this has a lot of flavor, too. I used 125% sourdough culture this time. It was difficult to put it in the tin but it was worth it! It has more moist in the crumb! Thank you, Daisy and Katie and rebecca! Second, Franko posted this recipe but he used 100% spelt flour that is more challenge for me. http://www.thefreshloaf.com/node/20057/loaf-my-wifefinally Although I posted it this recipe using 100% whole wheat, and 80% whole wheat. 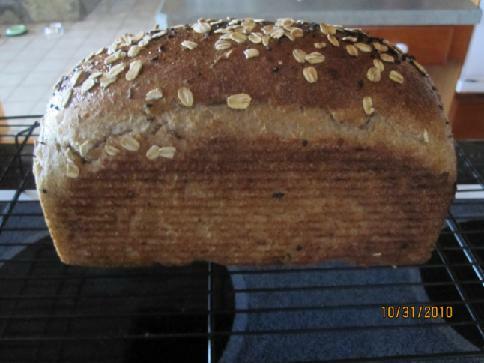 this time, I used white sourdough culture instead, and 50% white bread flour, 50% whole wheat flour and some wild rice and oats for the soaker. 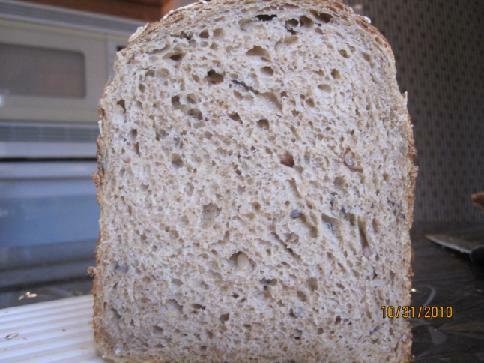 I also decreased the water amount down to 9% as like I made the other mutilgrain bread before. I have shopped some stuff for baking recently.. I can't still afford to buy spelt flour.... I will buy it and other flour that I want to try for other recipe when I can spend more money for extra. 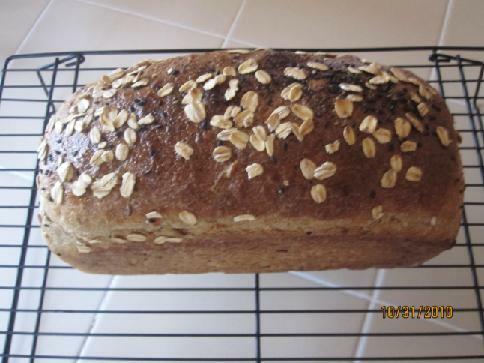 I sprinkled some toasted sesame seeds and oats on the top. I got this idea from Karin who posted a fabulous Straun on Khalid's blog. Thank you, Kharin. It tasted really really good! Thank you, Franko! In the end, This is the first time to post this bread that was posted by Hansjoakim. 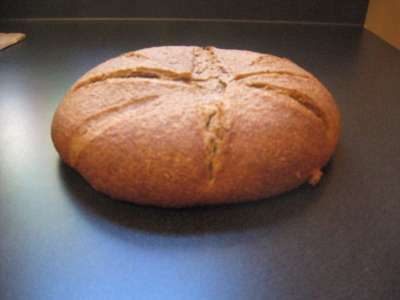 http://www.thefreshloaf.com/files/u9564/PaL_rye_formula.jpg I have made some of his rye bread that were excellent. This is his pain au levain. I love this bread. I tasted sour and sweet on the first day when I sliced them when it was slightly warm yet. I regreted that I did. As RobynNZ suggested me that I should have waited until it was completely cool. I always appreciate her help. Many thanks to you, Robyn. The next day, the taste was wonderful. We ate toasted 2 slices of this bread each with butter for this breadfast! Yummy!! I am really appreciate for all of you and Floyd who keeps the website peace and safe. Thank you, everybody. I found one lonely six-pack of Oktoberfest at a local market and gave it a home and a higher purpose. To make it extra festive I threw in a shot of Jaegermeister, too. I've made bread with beer and I've made bread with liquor, but this is the first time I've used both. It began as something of a novelty idea, but it actually works. The aroma during baking was incredible. That alone was almost worth it. And it's loaded with flavor! A little sweetness from the malty beer and sugary liquor, and a little anise/spice from the liquor, on top of the whole wheat / rye / sourdough combo - there's a lot going on. Not a subtle loaf. Snapshot: About a 70/30 mix of whole wheat/whole rye. Sourdough. Beer and liquor for all the liquid. Soaker: 454g WW bread flour, 1 tsp sea salt, 2 shots of Jaegermeister and enough beer to total 340g liquid. Mix 2-3 min., place in covered container at room temp. 12 hrs. 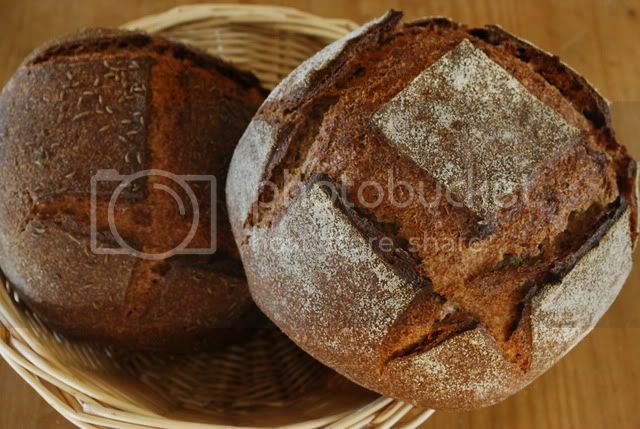 Starter: 140g WW starter @ 75% hydration, 300g whole rye flour, 120g WW bread flour, 325g beer. Combine and knead 3-4 min. Place in covered container at room temp. 12 hrs. 115g WW bread flour, 1 ¼ tsp sea salt, all of the soaker and starter. Combine and knead gently with wet hands 7-8 min. Ferment at room temp about 3 hrs. Shape. Proof at room temp about 2 hrs. Preheat stone to 500F. Top with caraway seeds if desired. Bake @ 475F for 10 min. with steam (I covered them with a stainless steel pan). Bake @ 415F for about another 40 min. They had an internal temp of 190F. Turn oven off, open the door and leave loaves in for another 15 min. Critique: Beautiful, thick, crunchy crust, if you're into that sort of thing (and I am). 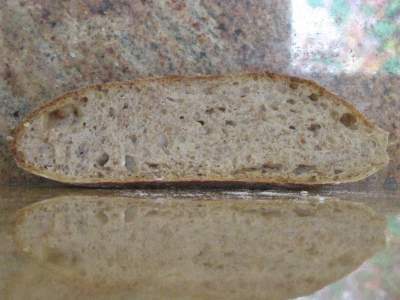 The crumb, however, is denser than I was hoping for. This is going to be sturdy bread under any circumstances, but I think it could have been more open than this. 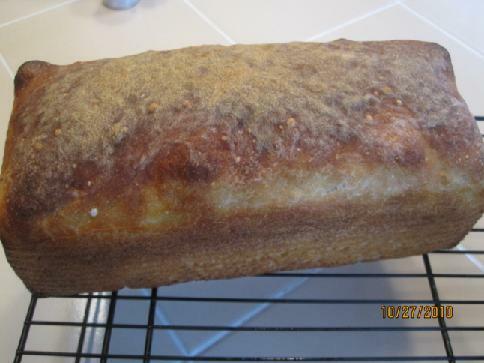 The rise was very sluggish compared to when I make this bread with water. I may have been asking too much of my sourdough to overcome all the booze in the dough. I don't ever feel like working hard after a shot and a beer either! Instant yeast in the final dough would, I think, be a big help, and I'll definitely add some next time. I didn't get around to posting yesterday, but I made my 5th weekly batch of Hamelman's baguette's with Poolish. Focused on making just 3 slashes per baguette. Tried SylviaH's magic towel steaming method. I forgot to turn the oven on when I meant to and did a final proof of 75 minutes instead of 60, while raised the preheat temperature to 550 for only 30 minutes to compensate for the stone being cold. I had a lot less luck with scoring this week--the lame kept dragging rather than cutting cleanly. I'm not sure if this was from proofing longer--I also didn't cover the baguettes as thoroughly with the folds of my make-shift couche as I have been doing. Crumb is clearly pretty tight, which is probably my fault; I still need more practice at being sufficiently gentle with these baguettes (or could that be over-proofing too?). 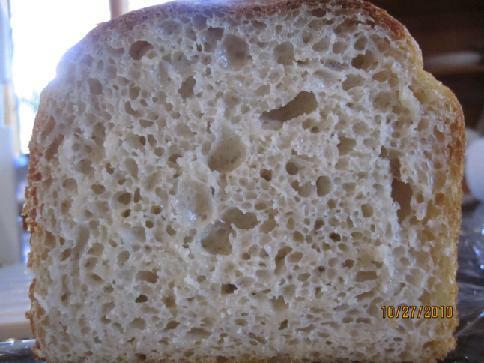 That said, the crumb had a nicer texture to it than I've been getting, and better flavor as well. The crust was great--crisp all around, and just a little chewy. A little over-dark on the bottom on account of overheating the stone, but even that wasn't too bad. If I never get my crust any better, I think I could live with that. I'm really not sure if this week's batch was overproofed, or if other problems led to my scoring and crumb issues. I'm going to stick with the 75 minute proof and see what happens if I do everything else right. So my plan for next week is to change nothing except a) Be even more gentle when shaping, and b) be more careful about covering the baguettes while proofing. I'll see how it goes. I was inspired by how simple this 1-2-3 Sourdough recipe was, but my first try was less than successful (OK taste, but dense brick crumb). So, taking the advice everyone was kind enough to offer, I tried again. I used the same levain (100% hydration, nothing but water and Brule Creek Farms dark rye flour). 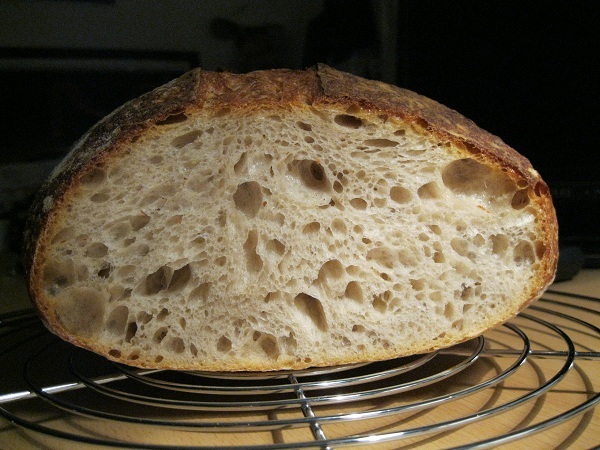 I keep it in the fridge, so I took it out and fed-and-dumped it once a day for three days until I had a doming rise and levain that (according to the Tartine test) floated in water. 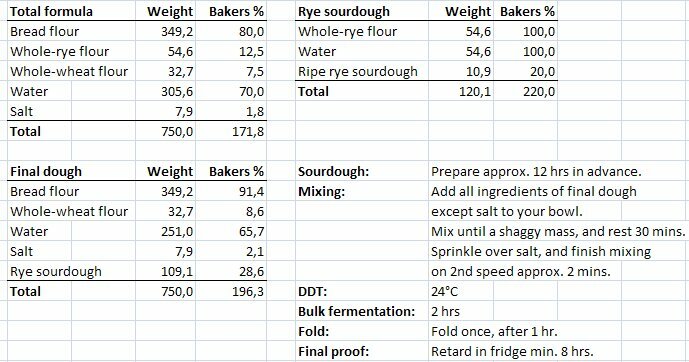 Based on previous advice, I started with more all-purpose flour and less rye than my first try to give the loaves more of a chance - here's the formula I used (PDF). This led to a dough with an overall hydration of about 71%, something I'm used to. 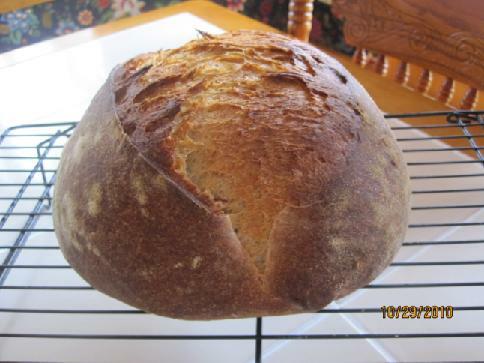 I mixed the ingredients, and left them to ferment for about 15 hours (before I went to bed, 6 hours after mixing the dough, it had risen maybe 20%, so I left it overnight at about 64F - this led to dough that had more than doubled overnight. Although not as airy as some sourdoughs I see, I'm very happy with the crumb. The sourness is about mid-range: not the sourest I've tasted, but not subtle. I think I'll be using this to accompany strongish lunch meats or cheese. It was about 14 hours between the last feed before the dough and my using it - I wonder if using it sooner might make the sourness a bit more subtle? Don't get me wrong - I like the reasonably assertive, but not overwhelming tang, but I'm thinking of ways to make it a bit less tangy. Thanks to everyone who helped me get to this point - I'll let you know how future loaves turn out. 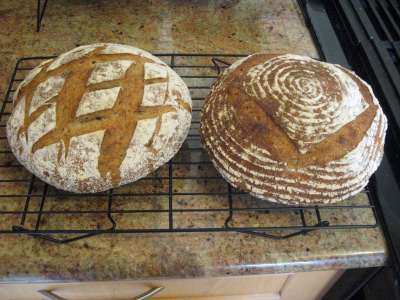 Yesterday I made another Vermont/Norwich Sourdough. I basically followed the recipe, but used medium dark rye flour instead of whole rye. 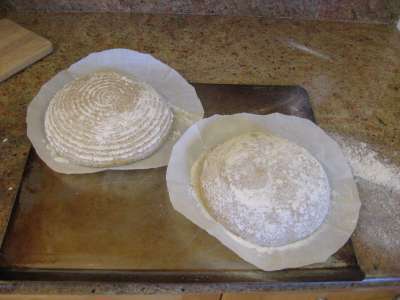 When I was about to shape the 1 kilogram piece of dough into a boule (see this great tutorial) I noticed that there weren't any clean kitchen towels left. 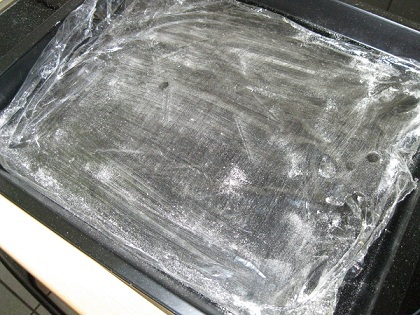 After a few moments of panicking I decided to do the final rising on a plastic wrap, which I lightly and evenly brushed with flour and put on a solid sheet (like this). Since this wasn't a rye bread and the shaping was tight enough for the dough to stand on its own, I didn't even need a banneton-like construction to support it. I was surprised that it worked really well and was much easier and less messy than with a towel. I could just turn the dough on my bread peel and then slowly remove the wrap from the top. A very convenient method, indeed. One visible difference was the lack of a structure that results from the pores of the towel. The only question left is: Which does more harm to the environment? Having to wash an additional towel or throwing away an additional piece of plastic wrap? Well, next time I will try the following: I have a non-solid/flexible foodgrade plastic mat. 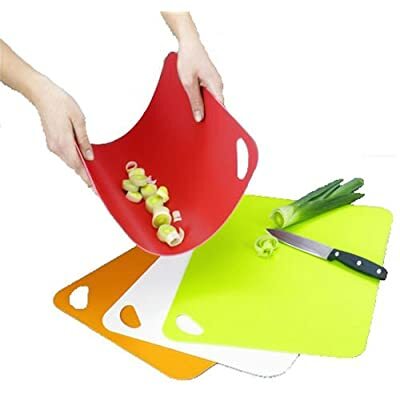 It's basically a cutting board, but not in a solid form but more like a thick flexible plastic sheet (something like this). So it should be easy to release this from the dough, too. Apart from the techniques it was also the first time I managed to successfully make two of the same kind of bread in a row, without any major mistakes resulting in the second attempt to be a total failure after the begginner's luck during the first try. 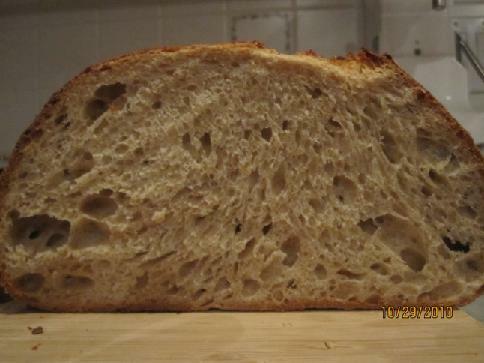 It was also my best crumb in a sourdough bread so far. Very very soft, without any major dense spots or gigantic holes. Yay! Karin's post was so tempting and seemed clear. I did my best to follow her method. I do think that the proofing times were a bit long for my kitchen temperature yesterday (80F,) which only emphasizes the lesson about being able to judge these things for oneself. 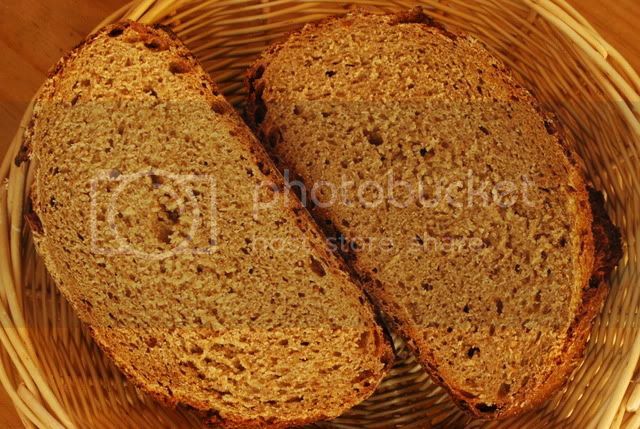 The cold soaker, the whole wheat starter and the spices combined into a very tasty loaf. Constructive criticism welcomed. Thanks, Karin. This is a seeded levain bread baked from Hansjoakim's recipe here. Boy was it tasty! Rye, though at 15% was pronounced, and had a wholewheat aftertaste. The seeds i used where flax, and sunflower. I involuntarily differed from Hans recipe. Due to my hectic schedule, my rye starter was overripe, and so was my Rye levain. I had to add commercial yeast to get this bread going, so the sour tang was not as intended by hans' recipe. 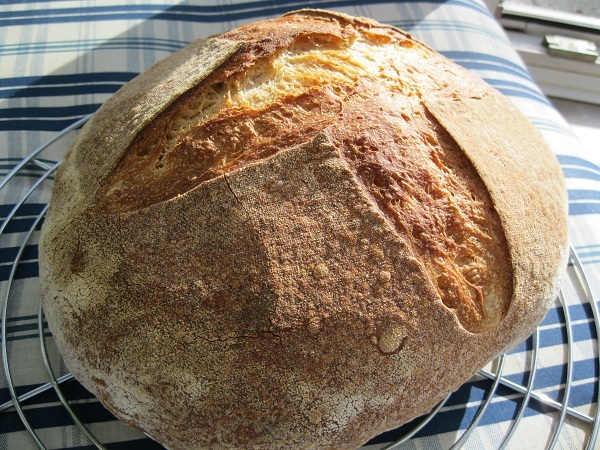 All in all, this bread is versatile, and appeals to many tastes including mine. 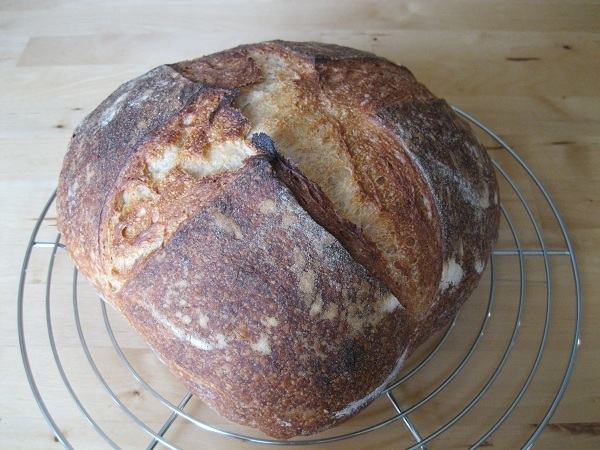 I shall make it again, once i get the Rye levain happy again. Thanks Hans for sharing you recipe! 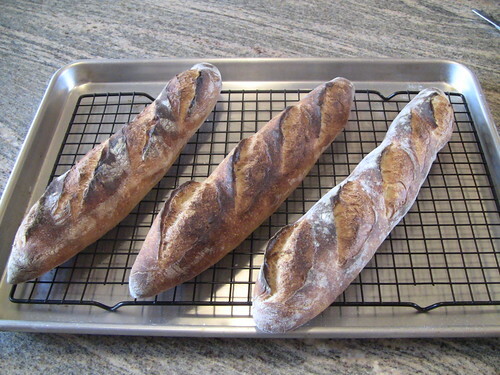 I planned to try proth5's sourdough baguettes this weekend, per Brother David's recommendation. And that turned out to be an especially good idea. It's rainy. My wife and I both have colds (or maybe we each have half of the same cold). Perfect time for chowder. And we have several pounds of Alaska Halibut in the freezer, caught by our neighbor. And chowder just needs to be accompanied by baguette. My previous attempt at baguette was with the Anis Bouabsa formula. It was a very trying experience for a near-novice working with that high-hydration dough (though the results were really good). My wife wanted something a bit sourer, and I wanted to believe that Pat's 65% hydration formula would also make a superb baguette. Now I believe. 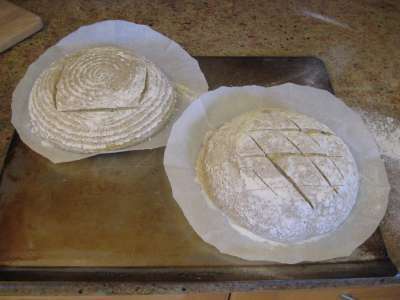 I followed proth5's formula, as reported in David's blog (http://tfl.thefreshloaf.com/node/10852/baguette-crumb-65-hydration-dough), using KAAP flour. I wanted to make three 9 oz baguettes (about 14 inches in length), so I increased the formula by 30%. And I used Sylvia's magic-steam-towel technique (http://www.thefreshloaf.com/node/20162/oven-steaming-my-new-favorite-way) for pre-steaming and supplemented it with the usual lava rocks in cast iron pan. The dough was much easier to work with than the Bouabsa dough. 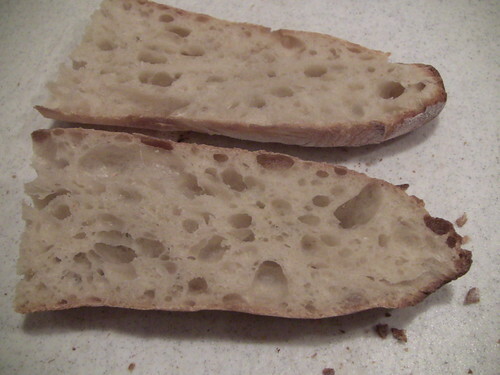 And the result is just the crispy-crusted-creamy-crumb-slightly-sour baguette I was going for. I think I'm becoming a better baguetter. The hot towels were also helpful in clearing my sinuses. The chowder was exceptional, too. A variation on my favorite clam chowder (Taddich Grill recipe), but with meaty chunks of Halibut. Hasn't cured the common cold, but I'd feel worse if I didn't have such good soup and bread. Thanks, Pat, and David, and Sylvia. Yet another variation on my 36 hour sourdough baguette dough, only this time, it's not baguette at all, it's pizza! Of couse it's nothing new to make high hydration baguette dough into pizza, but I didn't realize how convenient it is to combine the two. Same dough, but pizza doesn't need to proof, it bakes at the highest oven temp (which is the same temp I preheat my oven for baguettes), it bakes for only 8 minutes (way shorter than the proofing time for baguette dough) - all this means I can use a part of the dough to make and bake pizza while the rest are made into baguette and being proofed. 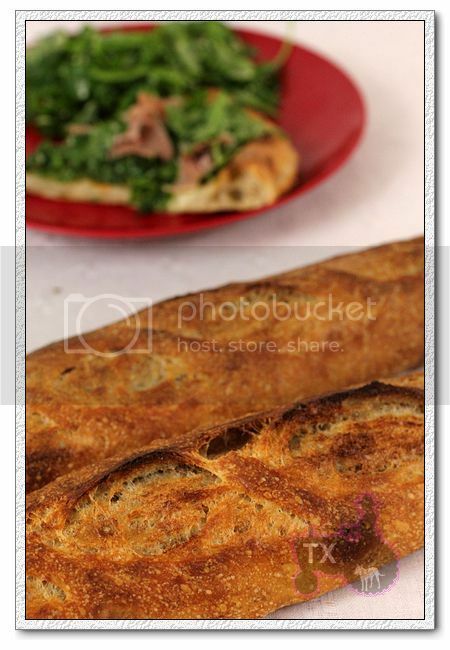 The pizza is made and mostly consumed before baguettes are scored and sent into the oven. How convenient, that's what I call stream-lined baking! 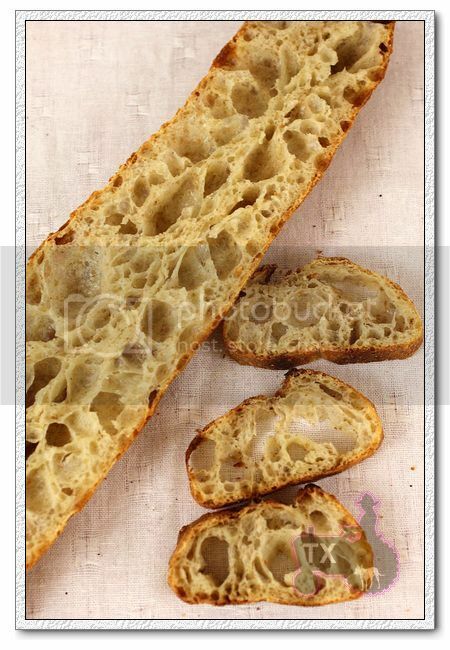 - Follow the basic 36 hour sourdough baguette formula here until dividing the dough into 4 parts, each around 230g. 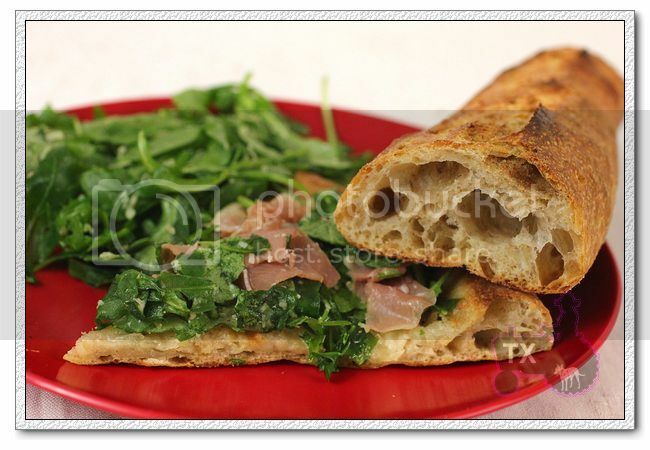 - After relaxing for 40min, stretch the pizza dough into a 11inch round, put on parchment. I find that it's hard to stretch the dough into desired size in one shot, so I stretch as far as I can, then let it rest on parchment. 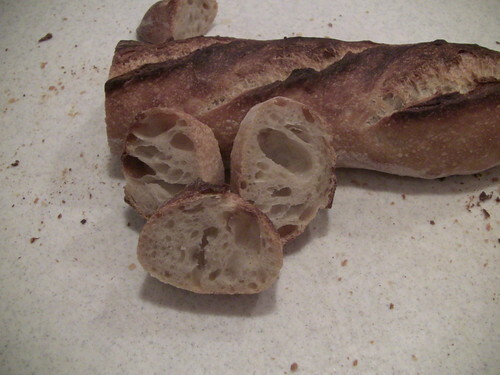 In the mean time, I go ahead and shape the other 3 pieces into baguettes and and it proof on parchment. By the time I get back to the pizza dough, it's easy to stretch. - Add topping. This time I first drizzle olive oil, then added fresh mozzarella, and grated cheddar. Send the pie into oven to bake at 550F (the highest temp my oven would go) for about 8min. 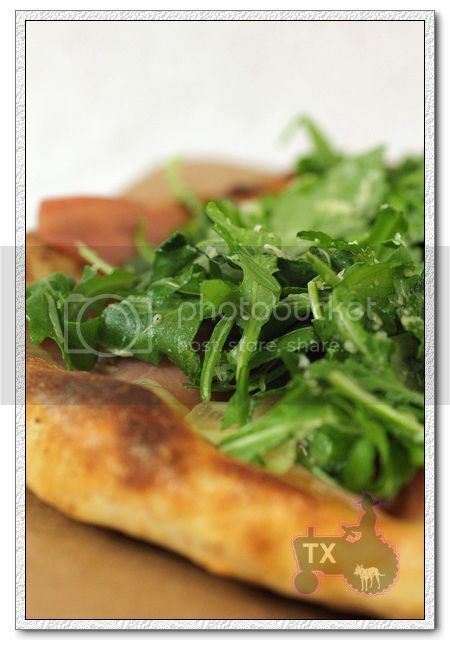 When taken out, the cheese is still bubbling, put on a layer of prosciutto, then a layer arugula (which was tossed with some olive oil and grated cheddar first). 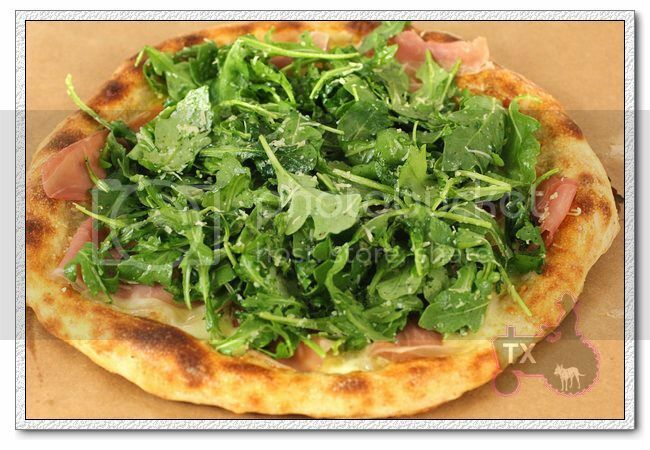 Prosciutto tend to get tough went it's baked too long, so it's added afterward, the residual heat is enough to blend all the flavors. 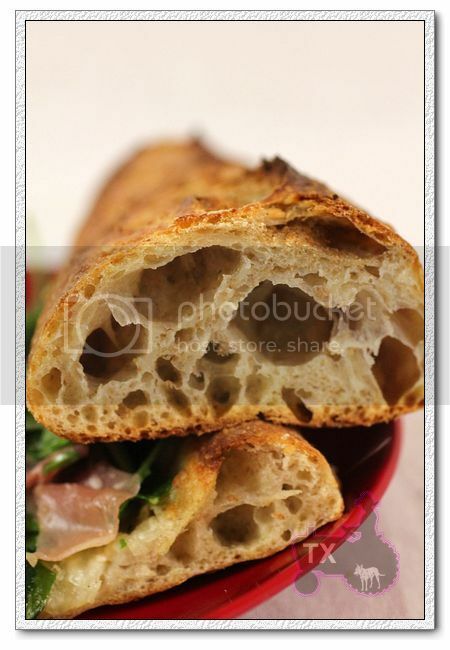 - Score and bake the other baguette doughs as usual when it's finished proofing. 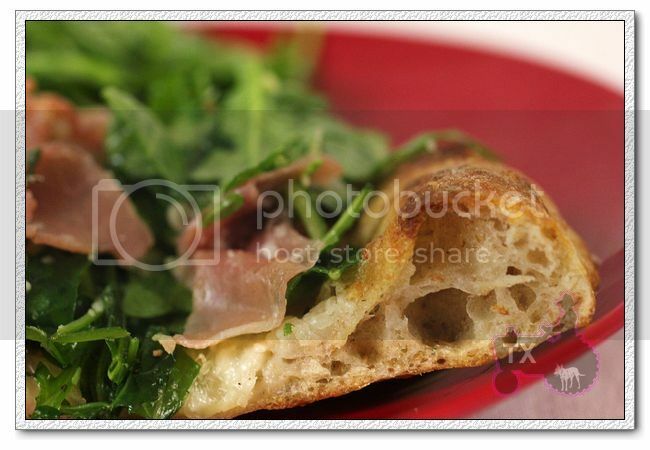 I really like the slight bitterness of arugula, a perfect match for prosciutto, and the cheese. The cheddar cheese I used was pretty salty, so I didn't add more salt. That, is what I call a good crust! The baguettes weren't half bad either, did I meantion how much I like the rye starter variation? The flavor is outstanding. I even got some "ears"! Getting a bit more confident with scoring the 80% dough. 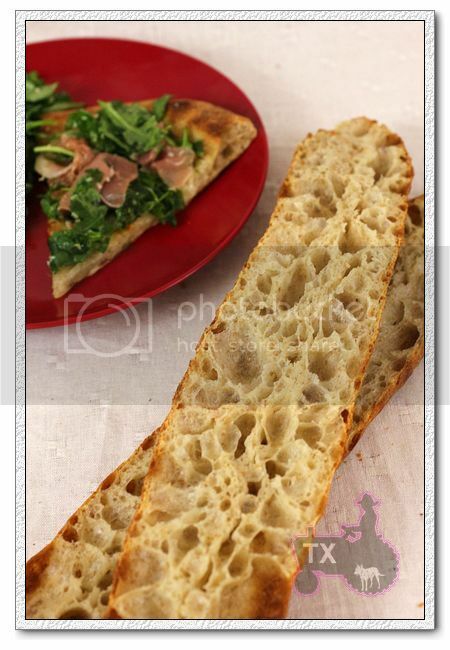 Who knew baguette and pizza are so similar? The process worked out so smoothly that I think I will always use one piece for pizza from now on - it would mean faster dinner and more room on baking stone for the baguettes.